In two simple sentences Nikki Grimes gives us the essence of her new book. The author graciously lets the readers into her life because, as she says, her journey out of the darkness may encourage others not to give in to despair: “…maybe somewhere in the story you will see yourself.” And an exhortation to write: “If you do, run and grab your pen and capture the moment on the pages of your own writer’s notebook.” The message of the book is to define your path and keep at it, no matter what comes your way. The early years were hard. Her parents went through cycles of separation and reconciliation, and Nikki and her older sister Carol were shipped from one relative to another. Circumstances conspired to send the two sisters to foster homes. Finally, the author found stability: “… linger in the warm memories of that house, that home, those people who opened their hearts to me.” It was there that she began to write. Through the darkest times there were mentors who stood by her. Her high school teacher encouraged her to survive and thrive; at James Baldwin’s feet she learned not only the craft of writing but also of being true to herself; and her father encouraged her to learn whatever caught her fancy. He believed that no learning was ever wasted. She took to the theatre and sees now that it helped her develop a keen ear for dialog as a means of imagining the character’s whole being. Chapter 5 is an excellent writing primer for writing instructors and educators. “I approach books like a jigsaw puzzle,” she says, each chapter like a piece of the story with its own narrative arc: its beginning, middle and end. “The truth is, you can only write a book one word, one sentence, one page at a time.” Hearing a well established author say that gives weight to the words. Writers can adopt the ‘put together the puzzle pieces’ strategy to focus on the small task on hand. Write an essay sentence by sentence, a story paragraph by paragraph and a book chapter by chapter; small puzzle pieces prevent you from being overwhelmed. This is a strategy that would benefit third through fifth grade readers, while showing the older students pathways to success not only in writing, but in life. A valuable addition to all libraries and classrooms and reading lists. Publisher: Richard C. Owen Publishers, Inc. Aimed at the fifth grade reading level and up, Earth Heroes: Champions of the Wilderness celebrates the lives of the most famous naturalists from their youth to the years where they made a lasting and significant impact on the world. The profiles detailed in Earth Heroes: Champions of the Wilderness have been carefully researched and are sure to inspire the youth of today to model the heroes of yesterday in how they approach, handle, and respect the environment. My favorite section of the book is titled, “Become a Hero!” and it offers a list of things readers can do to learn more about their environment, as well as games and websites that point wannabe naturalists to walk in the shoes of their favorite heroes. The eight heroes young readers will learn about include: Henry David Thoreau, John Muir, Theodore Roosevelt, Aldo Leopold, Richard, St. Barbe Baker, Mardy Murie, David Suzuki, and Wangari Maathai. To complement the text, there are vivid black and white photos and dramatic illustrations, along with a list of fast facts and a timeline of events related to each hero profiled that readers can easily digest and comprehend and that teachers and librarians can readily use to demonstrate in the classroom. Earth Heroes: Champions of the Wilderness is a must have for the reading lists of fifth grade teachers and elementary to middle school librarians. “Sometimes we forget to be curious” says author, Fran Hodgkins, in her introduction. In this book, she traces the lives of eight pioneers of ocean research who did not let the routine of everyday life take them away from their quest for knowledge about the vast ocean and its denizens. Each of the “oceanauts” mentioned in the book started their research to satisfy the curiosity burning within. 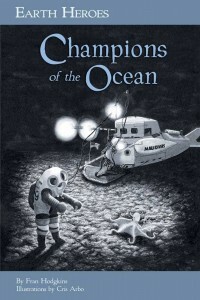 Earth Heroes: Champions of the Ocean features all eight researchers in order by their birthdate, which enables the readers to “begin at the beginning”. Ocean study was not a very advanced field. More scientists studied the earth than paid attention to the vast blue waters surrounding. Even William Beebe, the first researcher mentioned, began with terrestrial studies, and later developed a fascination for the ocean. Fifth grade readers will learn how new fields of study develop. Even as a geologist needs to go down the mine to study rocks, so an ocean researcher would benefit by immersing himself in the environment he wants to study. But there were not many tools available to the early researcher to actually enter the water. We can trace the progress of diving devices and vessels from the clunky diving helmet of Beebe’s time to the Jim Suit that Sylvia Earle donned to dive to a depth of 1250 feet, carrying her environment with her. It is written for ease of comprehension and the author brings out how each scientist, despite having their own interest and focus, built on the discoveries of the predecessor. We “journey through their lives”, learn about the people, their discoveries, and the ocean they are so passionately devoted to. If even a few readers become stewards of the oceans and its inhabitants the book would have succeeded in its purpose.